In this article, you'll learn how to access all the features the Sublime plugin has to offer. The only prerequisites are that you have Kite Engine running and the Sublime plugin installed. 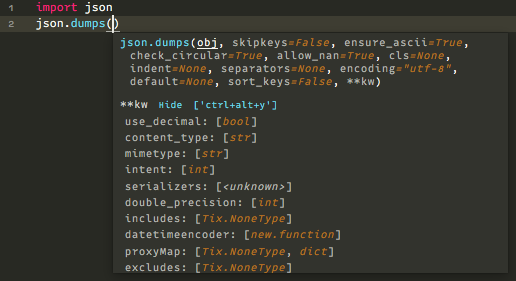 If you don't have the Sublime plugin installed, you can learn how to do so here. Note: If you installed the Sublime plugin while Sublime was already running, you'll need to restart Sublime for the plugin to activate. If Kite is installed properly, you should see a text indicator at the bottom left corner of the Sublime window. Kite: Connection error Kite Engine is not running. Kite: Server error Kite Engine is running, but you need to log in. 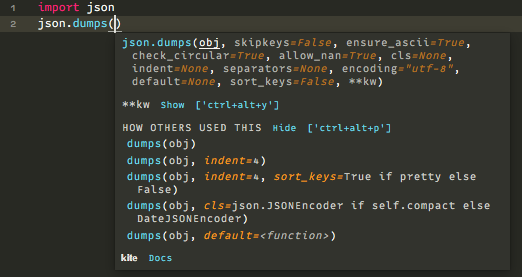 Kite: Indexing Kite is analyzing your code. The top half of the UI shows the arguments that the function accepts. Arguments with default values will also have their default values shown. You may also click on the "Show" **kw link to show the arguments that are found in the keyword arguments dictionary. The “How others used this” section in the bottom half of the UI shows you common ways other programmers use the function json.dumps. Kite learns these calling patterns by analyzing all the open source code available on GitHub and then ranks them from most popular to last popular. If you are calling a function that you have defined locally, Kite will extract patterns from your codebase directly instead of GitHub. You can also jump to the definition of a module, class or function from your local codebase using Kite. The hover UI provides a def link to do so.